Not to be confused with Ludites. For the EP by Grotus, see Luddite (EP). The Luddites were a secret oath-based organization of English textile workers in the 19th century, a radical faction which destroyed textile machinery as a form of protest. The group was protesting against the use of machinery in a "fraudulent and deceitful manner" to get around standard labour practices. Luddites feared that the time spent learning the skills of their craft would go to waste, as machines would replace their role in the industry. Over time, however, the term has come to mean one opposed to industrialisation, automation, computerisation, or new technologies in general. The Luddite movement began in Nottingham at a time in England and culminated in a region-wide rebellion that lasted from 1811 to 1816. Mill and factory owners took to shooting protesters and eventually the movement was suppressed with legal and military force. The lower classes of the 18th century were not openly disloyal to the king or government, generally speaking, and violent action was rare because punishments were harsh. The majority of individuals were primarily concerned with meeting their own daily needs. Working conditions were harsh in the mills but efficient enough to threaten the livelihoods of skilled artisans. The new inventions produced faster and cheaper labour because machines were operated by less-skilled, low-wage labourers, and the Luddite goal was to gain a better bargaining position with their employers. Malcolm L. Thomis argued in his 1970 history The Luddites that machine-breaking was one of a very few tactics that workers could use to increase pressure on employers, to undermine lower-paid competing workers, and to create solidarity among workers. "These attacks on machines did not imply any necessary hostility to machinery as such; machinery was just a conveniently exposed target against which an attack could be made." An agricultural variant of Luddism occurred during the widespread Swing Riots of 1830 in southern and eastern England, centering on breaking threshing machines. The Luddites met at night on the moors surrounding industrial towns to practice drills and maneuvers. Their main areas of operation began in Nottinghamshire in November 1811, followed by the West Riding of Yorkshire in early 1812 then Lancashire by March 1813. They smashed stocking frames and cropping frames among others. There does not seem to have been any political motivation behind the Luddite riots and there was no national organization. The men were merely attacking what they saw as the reason for the decline in their livelihoods. Luddites battled the British Army at Burton's Mill in Middleton and at Westhoughton Mill, both in Lancashire. The Luddites and their supporters anonymously sent death threats to, and possibly attacked, magistrates and food merchants. Activists smashed Heathcote's lacemaking machine in Loughborough in 1816. He and other industrialists had secret chambers constructed in their buildings that could be used as hiding places during an attack. In 1817, an unemployed Nottingham stockinger and probably ex-Luddite, named Jeremiah Brandreth led the Pentrich Rising. While this was a general uprising unrelated to machinery, it can be viewed as the last major Luddite act. Later interpretation of machine breaking (1812), showing two men superimposed on an 1844 engraving from the Penny magazine which shows a post 1820s Jacquard loom. [c] Machine-breaking was criminalised by the Parliament of the United Kingdom as early as 1721, the penalty being penal transportation, but as a result of continued opposition to mechanisation the Frame Breaking Act 1812 made the death penalty available: see "criminal damage in English law". The British Army clashed with the Luddites on several occasions. At one time there were more British soldiers fighting the Luddites than there were fighting Napoleon on the Iberian Peninsula. [d] Three Luddites, led by George Mellor, ambushed and assassinated mill owner William Horsfall of Ottiwells Mill in Marsden, West Yorkshire at Crosland Moor in Huddersfield. Horsfall had remarked that he would "Ride up to his saddle in Luddite blood." Mellor fired the fatal shot to Horsfall's groin, and all three men were arrested. Lord Byron denounced what he considered to be the plight of the working class, the government’s inane policies and ruthless repression in the House of Lords on 27 February 1812: "I have been in some of the most oppressed provinces of Turkey; but never, under the most despotic of infidel governments, did I behold such squalid wretchedness as I have seen since my return, in the very heart of a Christian country." The British government sought to suppress the Luddite movement with a mass trial at York in January 1813, following the attack on Cartwrights mill at Rawfolds near Cleckheaton. The government charged over 60 men, including Mellor and his companions, with various crimes in connection with Luddite activities. While some of those charged were actual Luddites, many had no connection to the movement. Although the proceedings were legitimate jury trials, many were abandoned due to lack of evidence and 30 men were acquitted. These trials were certainly intended to act as show trials to deter other Luddites from continuing their activities. The harsh sentences of those found guilty, which included execution and penal transportation, quickly ended the movement. Parliament made "machine breaking" (i.e. industrial sabotage) a capital crime with the Frame Breaking Act of 1812. Lord Byron opposed this legislation, becoming one of the few prominent defenders of the Luddites after the treatment of the defendants at the York trials. Coincidentally, Lord Byron's only legitimate daughter Ada Lovelace would become the first computer programmer by combining the technology of the Analytical Engine with the Jacquard loom. In 1867, Karl Marx wrote that it would be some time before workers were able to distinguish between the machines and "the form of society which utilizes these instruments" and their ideas. "The instrument of labour, when it takes the form of a machine, immediately becomes a competitor of the workman himself." In the 19th century, occupations that arose from the growth of trade and shipping in ports, also in "domestic" manufacturers, were notorious for precarious employment prospects. Underemployment was chronic during this period, and it was common practice to retain a larger workforce than was typically necessary for insurance against labour shortages in boom times. Moreover, the organization of manufacture by merchant-capitalists in the textile industry was inherently unstable. While the financiers' capital was still largely invested in raw material, it was easy to increase commitment where trade was good and almost as easy to cut back when times were bad. Merchant-capitalists lacked the incentive of later factory owners, whose capital was invested in building and plants, to maintain a steady rate of production and return on fixed capital. In view of the combination of seasonal variations in wage rates and violent short-term fluctuations springing from harvests and war, periodic outbreaks of violence are more easily understood. In 1956, a speech said that "organized workers were by no means wedded to a Luddite Philosophy." More recently,[when?] the term Neo-Luddism has emerged to describe opposition to many forms of technology. According to a manifesto drawn up by the Second Luddite Congress (April 1996; Barnesville, Ohio), Neo-Luddism is "a leaderless movement of passive resistance to consumerism and the increasingly bizarre and frightening technologies of the Computer Age." The term "Luddite fallacy" is used by economists in reference to the fear that technological unemployment inevitably generates structural unemployment and is consequently macroeconomically injurious. If a technological innovation results in a reduction of necessary labour inputs in a given sector, then the industry-wide cost of production falls, which lowers the competitive price and increases the equilibrium supply point which, theoretically, will require an increase in aggregate labour inputs. ^ Historian Eric Hobsbawm has called their machine wrecking "collective bargaining by riot", which had been a tactic used in Britain since the Restoration because manufactories were scattered throughout the country, and that made it impractical to hold large-scale strikes. ^ The Falmouth magistrates reported to the Duke of Newcastle (16 Nov. 1727) that "the unruly tinners" had "broke open and plundered several cellars and granaries of corn." Their report concludes with a comment which suggests that they were not able to understand the rationale of the direct action of the tinners: "the occasion of these outrages was pretended by the rioters to be a scarcity of corn in the county, but this suggestion is probably false, as most of those who carried off the corn gave it away or sold it at quarter price." PRO, SP 36/4/22. ^ Hobsbawm has popularized this comparison and refers to the original statement in Frank Ongley Darvall (1969) Popular Disturbances and Public Order in Regency England, London, Oxford University Press, p. 260. ^ "A nod to Ned Ludd". Retrieved 6 November 2018. ^ "What the Luddites Really Fought Against". Retrieved 8 December 2016. ^ "Who were the Luddites?". History.com. Retrieved 12 December 2016. ^ "Luddite" Compact Oxford English Dictionary at AskOxford.com. Accessed 22 February 2010. ^ Anstey at Welcome to Leicester (visitoruk.com) According to this source, "A half-witted Anstey lad, Ned Ludlam or Ned Ludd, gave his name to the Luddites, who in the 1800s followed his earlier example by expressing violence against machinery in protest against the Industrial Revolution." It is a known theory that Ned Ludd was the group leader of the Luddites. ^ "The National Archives Learning Curve | Power, Politics and Protest | the Luddites". The National Archives. Retrieved 19 August 2011. ^ Hobsbawm, Eric (4 July 2009). "'The Machine Breakers', Past and Present 1 (1952), 57–70". Libcom.org. Retrieved 4 October 2013. ^ Robert Featherstone Wearmouth (1945). Methodism and the common people of the eighteenth century. Epworth Press. p. 51. Retrieved 21 April 2013. ^ R. F. Wearmouth, Methodism and the Common People of the Eighteenth Century. (1945), esp. chs. 1 and 2. ^ Merchant, Brian. "You've Got Luddites All Wrong". Vice. Retrieved 13 October 2014. ^ Binfield, Kevin (2004). Luddites and Luddism. Baltimore and London: The Johns Hopkins University Press. ^ Rude, George (2001). The Crowd in History: A Study of Popular Disturbances in France and England, 1730–1848. Serif. ^ a b Thomis, Malcolm (1970). 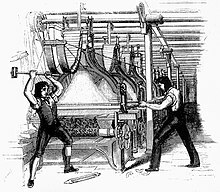 The Luddites: Machine Breaking in Regency England. Shocken. ^ "Historical events – 1685–1782 | Historical Account of Newcastle-upon-Tyne (pp. 47–65)". British-history.ac.uk. 22 June 2003. Retrieved 4 October 2013. ^ a b c d Charles Wilson, England's Apprenticeship, 1603-1763 (1965), pp. 344–45. PRO, SP 36/4/22. ^ a b Conniff, Richard. "What the Luddites Really Fought Against". Smithsonian. Retrieved 19 October 2016. ^ Beckett, John. "Luddites". The Nottinghamshire Heritage Gateway. Thoroton Society of Nottinghamshire. Retrieved 2 March 2015. ^ Conniff, Richard. "What the Luddites Really Fought Against". smithsonianmag.com. Retrieved 18 June 2013. ^ "The Luddites 1811-1816". www.victorianweb.org. Retrieved 22 November 2016. ^ Dinwiddy, J.R. (1992). "Luddism and Politics in the Northern Counties". Radicalism and Reform in Britain, 1780–1850. London: Hambledon Press. pp. 371–401. ^ Sale 1995, p. 188. ^ "Workmen discover secret chambers". BBC News. Retrieved 31 December 2012. ^ Sharp, Alan (4 May 2015). Grim Almanac of York. The History Press. ISBN 9780750964562. ^ "Luddites in Marsden: Trials at York". Archived from the original on 26 March 2012. Retrieved 12 May 2012. ^ Elizabeth Gaskell: The Life of Charlotte Bronte, Vol. 1, Ch. 6, for contemporaneous description of attack on Cartwright. ^ "Lord Byron and the Luddites | The Socialist Party of Great Britain". www.worldsocialism.org. Archived from the original on 24 June 2016. Retrieved 22 November 2016. ^ Plant, Sadie (1 November 1995). "The Future Looms: Weaving Women and Cybernetics". Body & Society. 1: 45–64 – via Sage Publications. ^ Sale 1995, p. 205. ^ Jones, Steve E. (2006). Against technology: from the Luddites to neo-Luddism. CRC Press. p. 20. ISBN 978-0-415-97868-2. ^ Jerome, Harry (1934). Mechanization in Industry, National Bureau of Economic Research. pp. 32–35. Archer, John E. (2000). "Chapter 4: Industrial Protest". Social unrest and popular protest in England, 1780–1840. Cambridge University Press. ISBN 978-0-521-57656-7. Bailey, Brian J (1998). The Luddite Rebellion. NYU Press. ISBN 0-8147-1335-1. Grint, Keith & Woolgar, Steve (1997). "The Luddites: Diablo ex Machina". The machine at work: technology, work, and organization. Wiley-Blackwell. ISBN 978-0-7456-0924-9. Ewan McGaughey (2018). "Will Robots Automate Your Job Away? Full Employment, Basic Income, and Economic Democracy". ssrn.com. Rude, George (2005). "Chapter 5, Luddism". The crowd in History, 1730–1848. Serif. ISBN 978-1-897959-47-3. Sale, Kirkpatrick (1995). Rebels against the future: the Luddites and their war on the Industrial Revolution: lessons for the computer age. Basic Books. ISBN 0-201-40718-3. Thompson, E. P. (1991). The Making of the English Working Class. Penguin Books. ISBN 978-0-14-013603-6. Archived from the original on 6 October 2014. Retrieved 16 November 2014. Wikimedia Commons has media related to Luddism. Look up Luddite in Wiktionary, the free dictionary. The Luddites (1988) Thames Television drama-documentary about the West Riding Luddites. This page was last edited on 22 April 2019, at 05:07 (UTC).